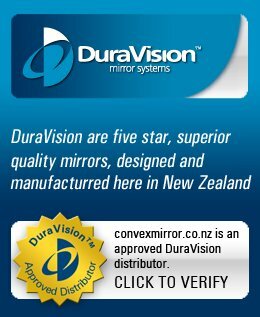 Find the products you wish to order from the menu (eg: Indoor Mirrors, Outdoor Mirrors, Forklift Mirrors etc.) or use the Help Me Choose tab. Choose the model and size product you wish to buy by clicking on the picture. In the Qty box, enter the amount of items you wish to buy. Click on the Add to Cart button on the product page. Click on the Shopping Cart button (top right corner, blue circle with a picture of a bag). Select Register Account if you plan to re-order, or select Guest Checkout if it is a one off purchase. Choose to pay by Credit Card or Bank Transfer. (If you choose to pay by Bank Transfer, we will email an Invoice to you for payment). Order confirmation will be sent to your email address. Small to large items are sent with Fastway Couriers. Overnight for North Island, 2 Days for South Island (no weekend deliveries). Extra Large items (eg: 1000mm, 1200mm) are sent with Mainstream Transport (no weekend deliveries). For information please see our SHIPPING AND RETURNS page.